Mas Kagin Tapani: Are we concerned about our Tuna industry? "There was this project called the PNG Tagging Project, phase 1 of which was completed in May 2007. It was part of a wider programme called the Pacific Tuna Tagging Programme (PTTP). The Secretariat of the Pacific Community (SPC) and PNG's very own National Fisheries Authority collaborated in tagging the migratory tuna species and monitoring their movements around the Southwest Pacific Ocean. 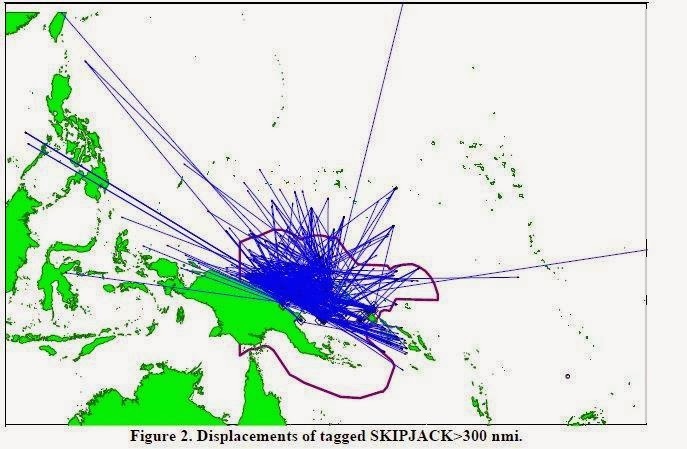 Pictured above are updated graphics showing the movements of tagged tuna. Skipjack continue to show the greatest mobility, followed by yellow-fin and big-eye tuna. Notice how the Bismarck Sea is where the tuna species are endemic and the known converging point for these tuna species...If I had it my way, the whole Bismarck Sea and adjoining islands will be OFF-LIMITS to any environmentally-destructive mining activities so that these multi-billion kina resource is safe...! 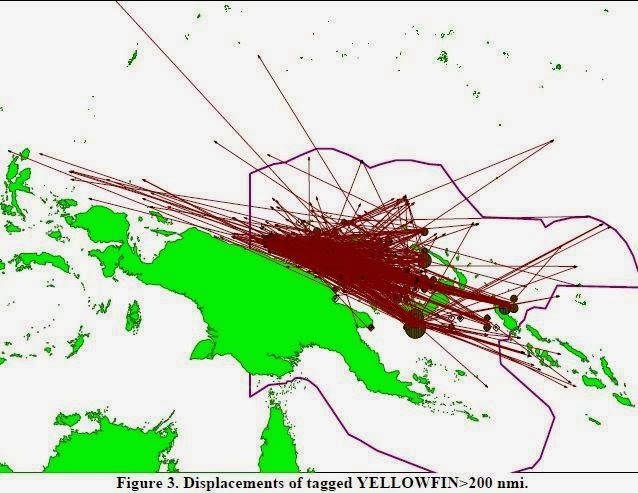 (Source: PACIFIC TUNA TAGGING PROGRAMME MONTHLY TAGGING SUMMARY – NOVEMBER 2007)"